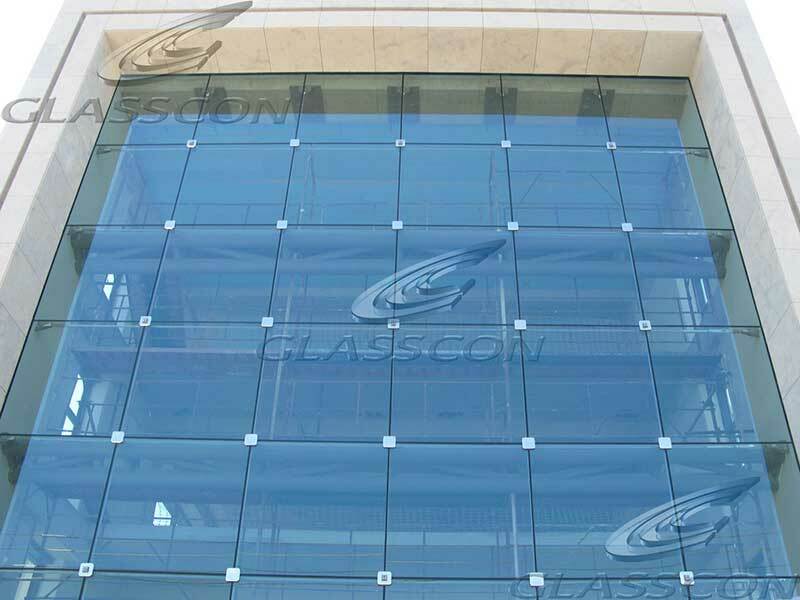 GLASSCON has structurally designed and constructed the façade and the spider glass curtain wall with suspended cables of a new office building .The façade has a total height of 25 m. and a width of 29.3 m.The structure is supported through a grid of stainless steel prestressed cables.The loads are calculated according to Eurocode 1(EC1) and a carried through stainless steel cables of Φ22mm cross section thickness. 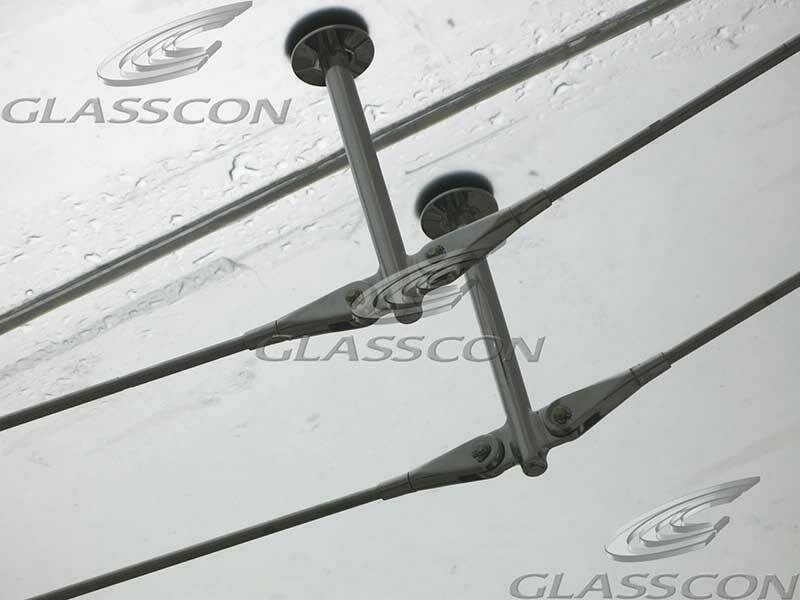 Prestress of 90kN has been applied at the horizontal cables and 43kN at the vertical. 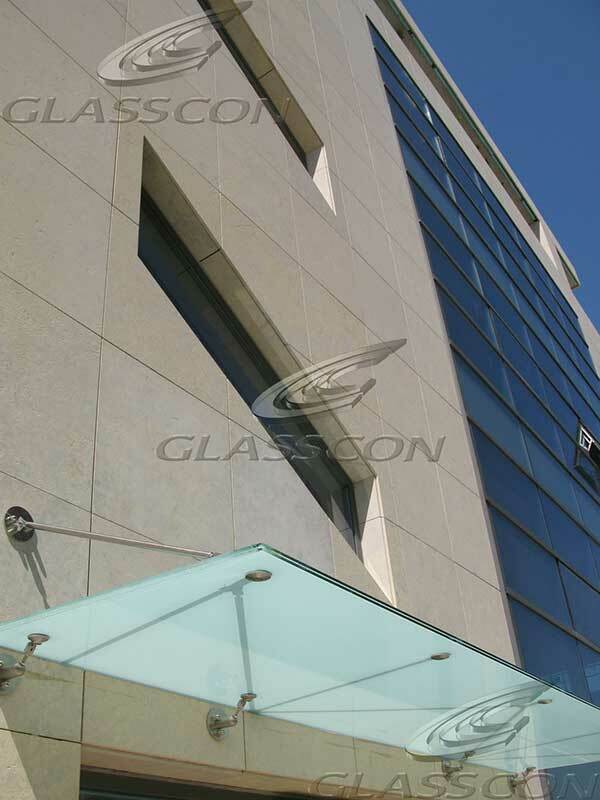 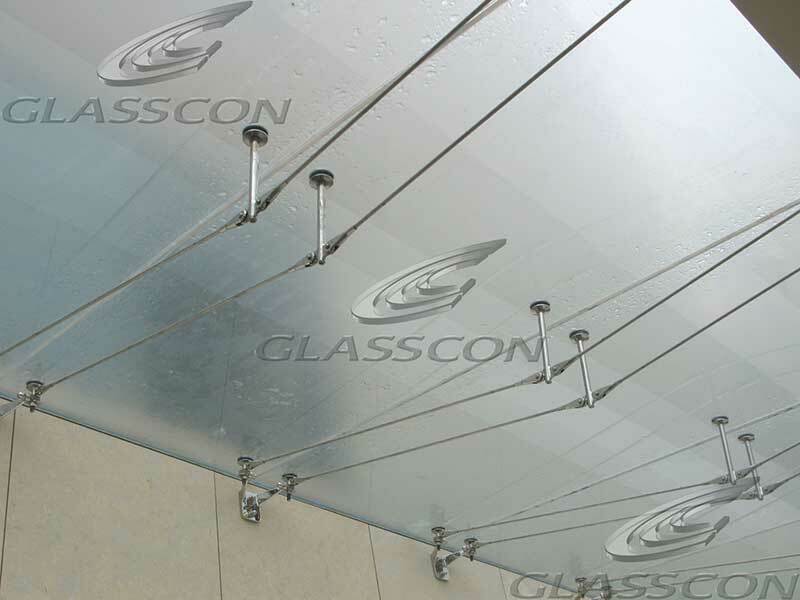 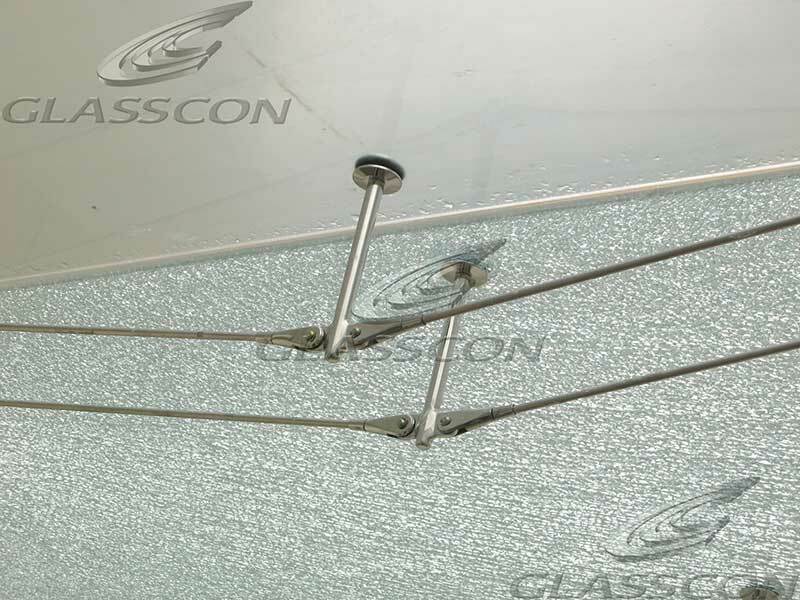 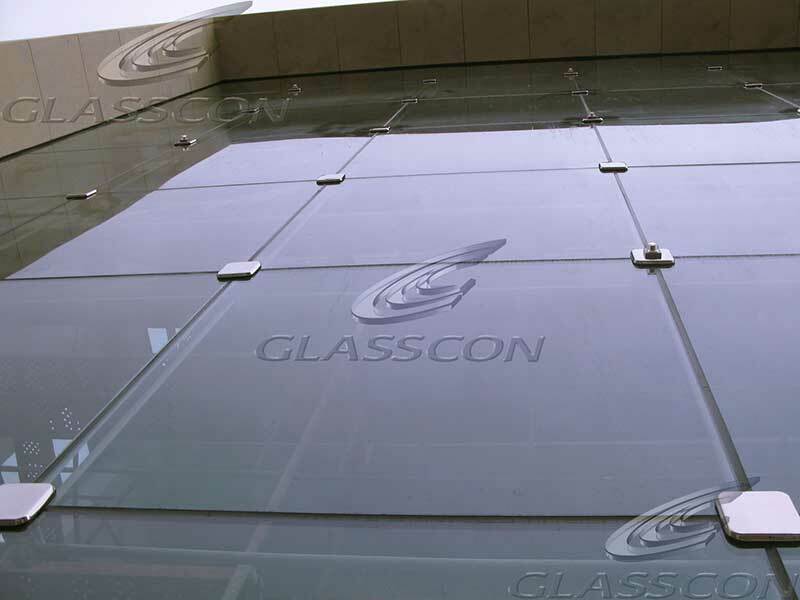 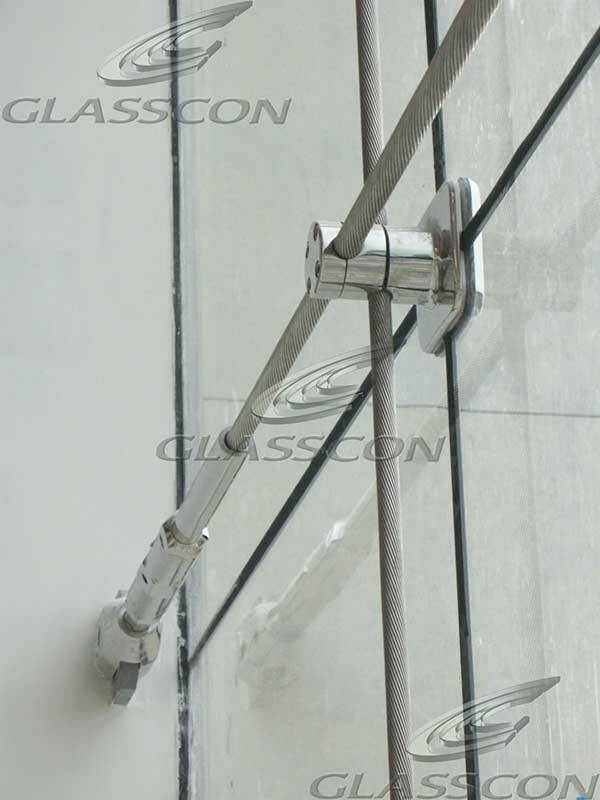 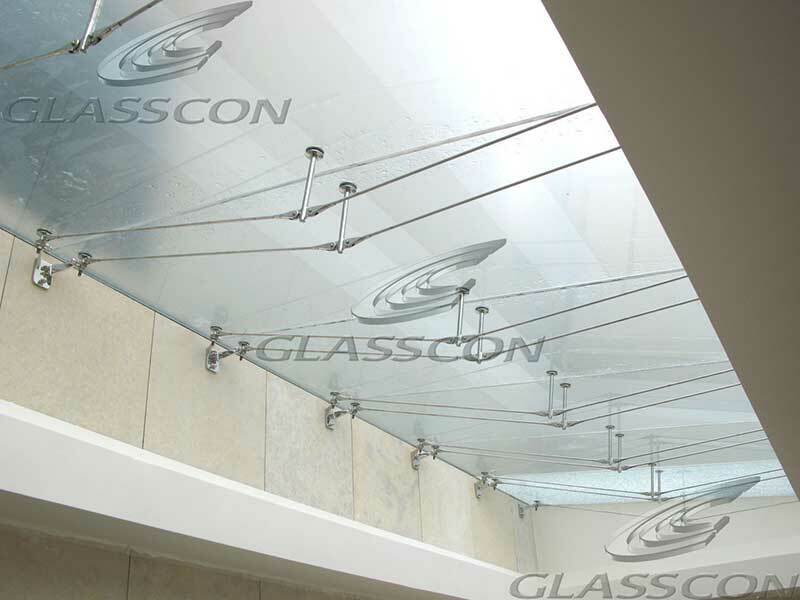 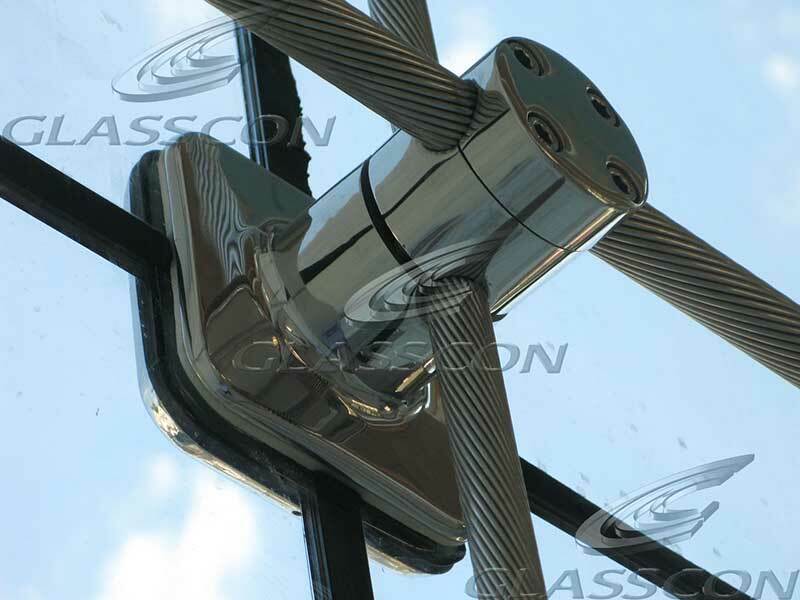 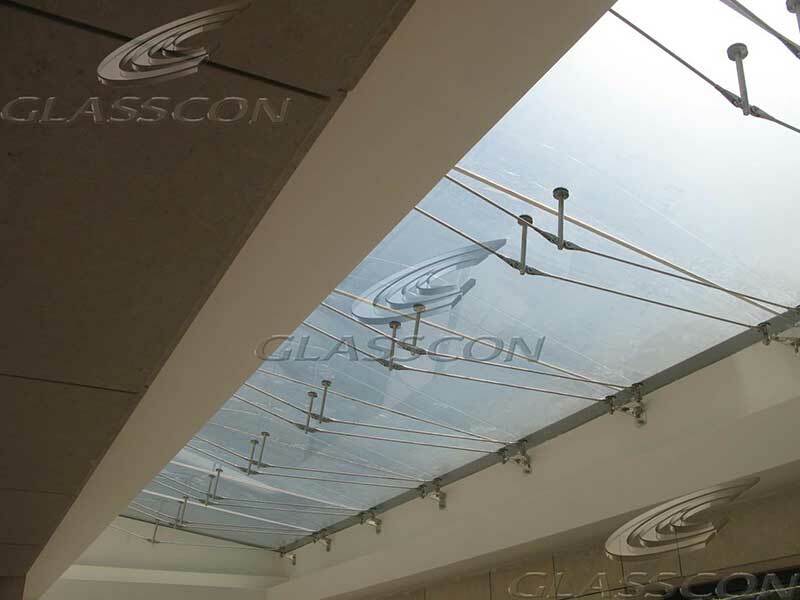 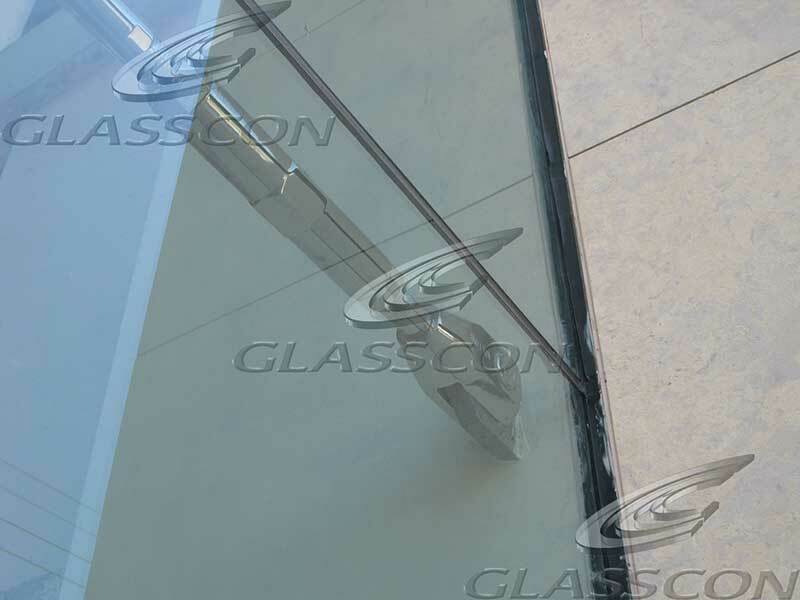 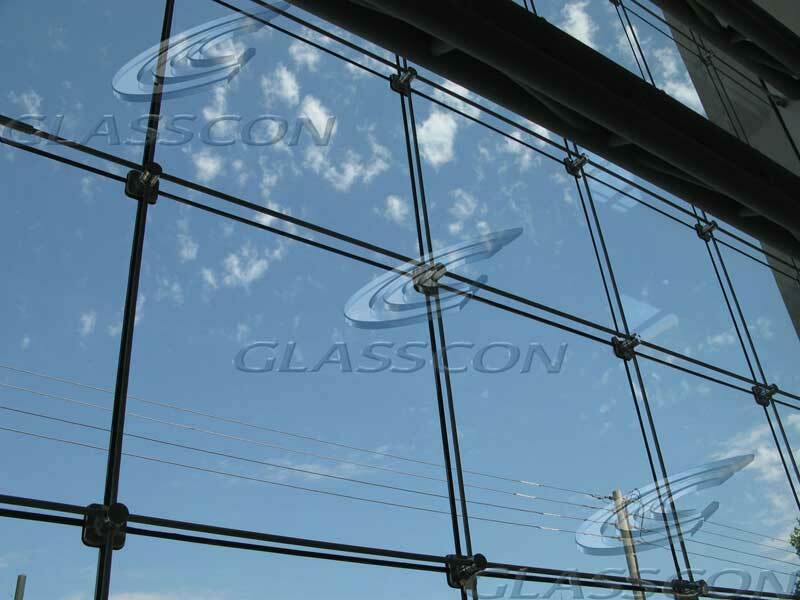 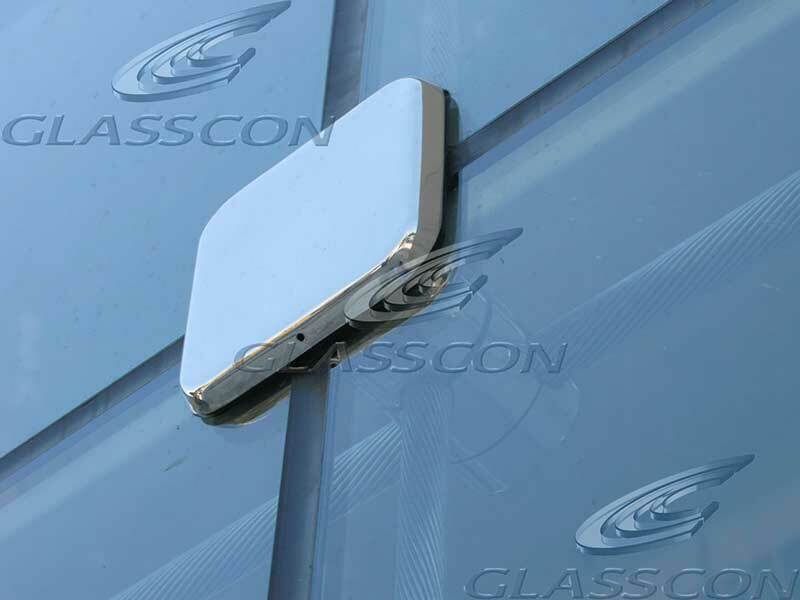 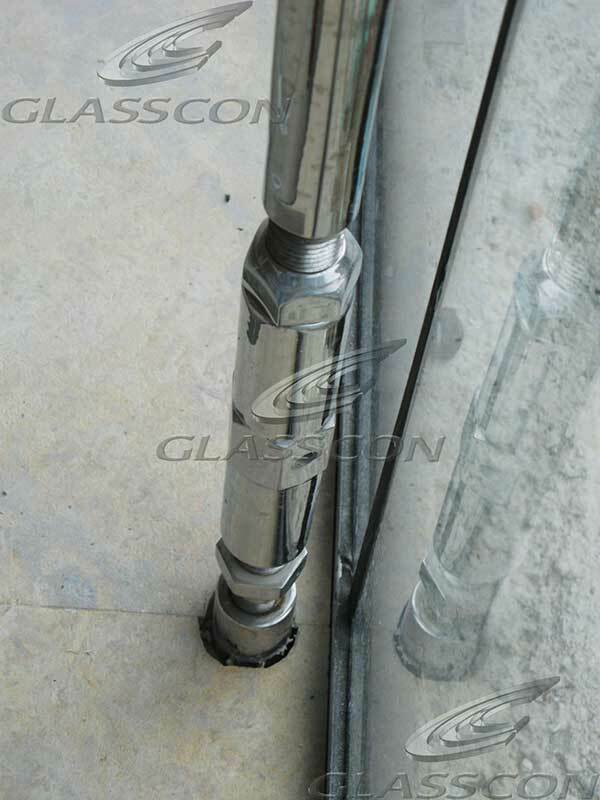 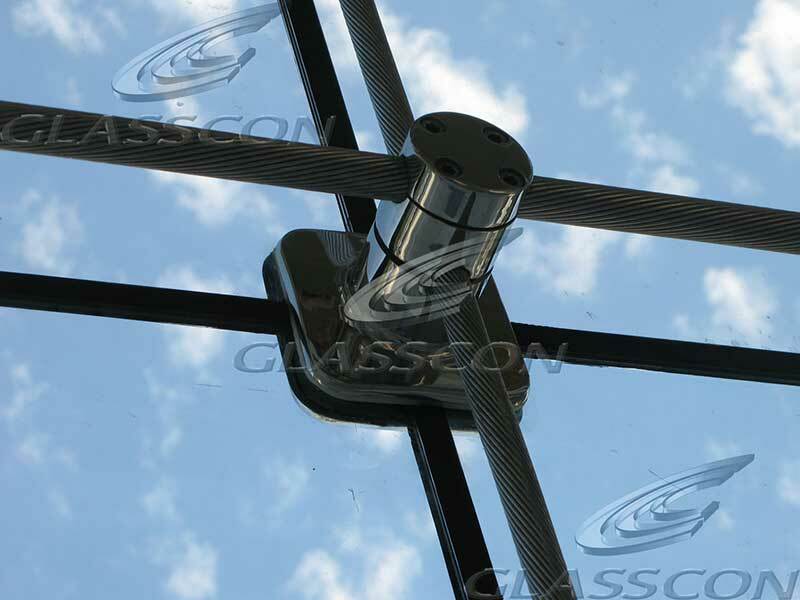 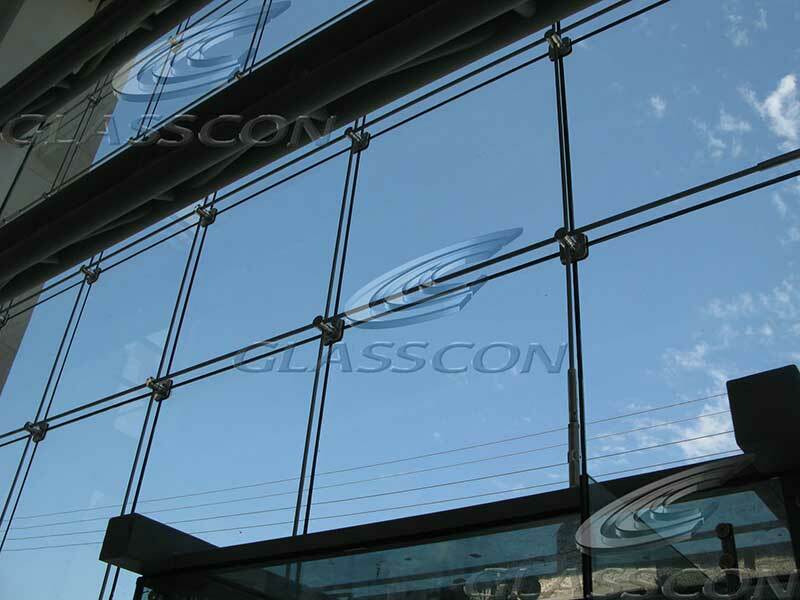 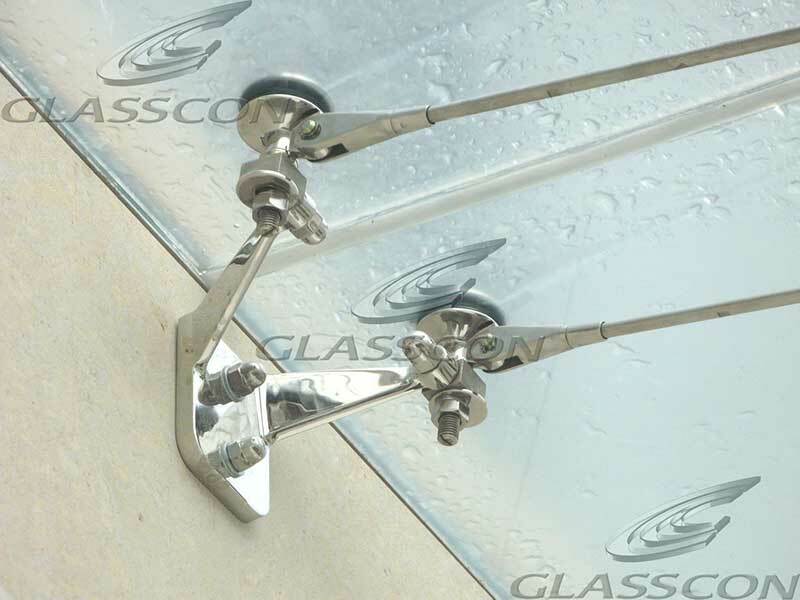 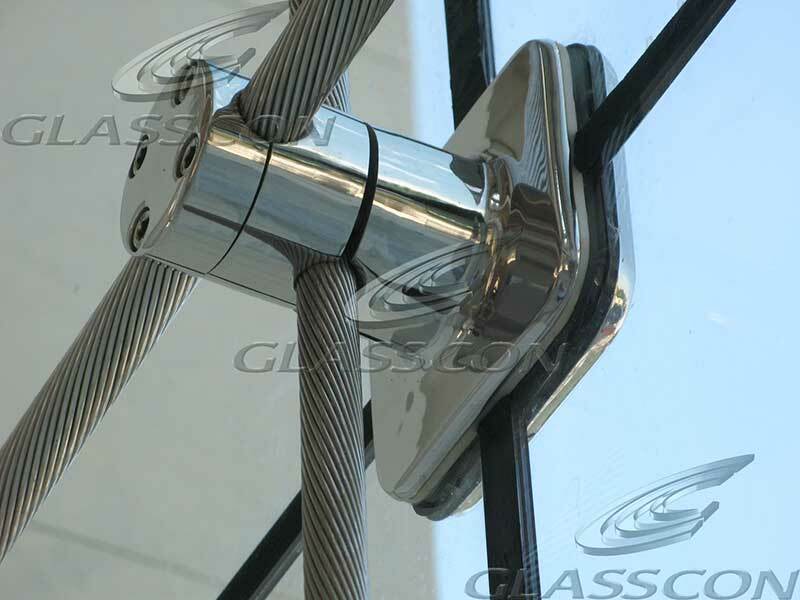 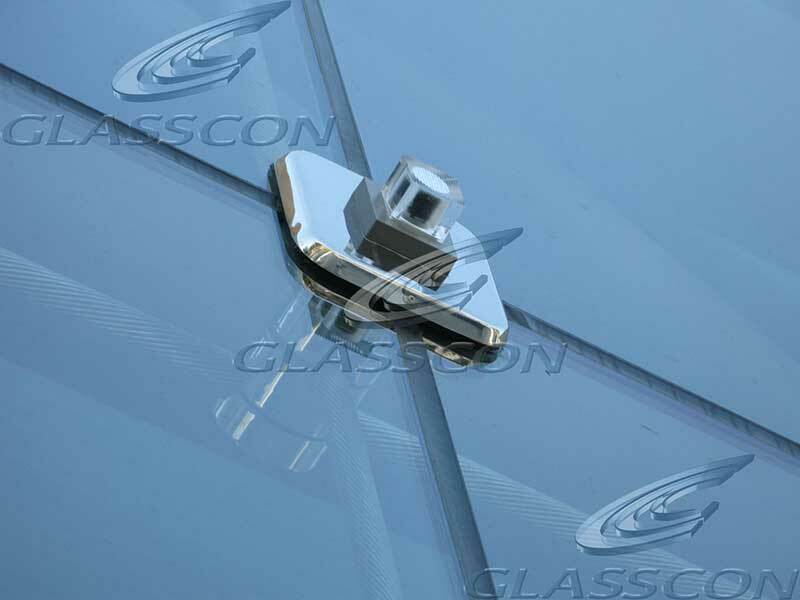 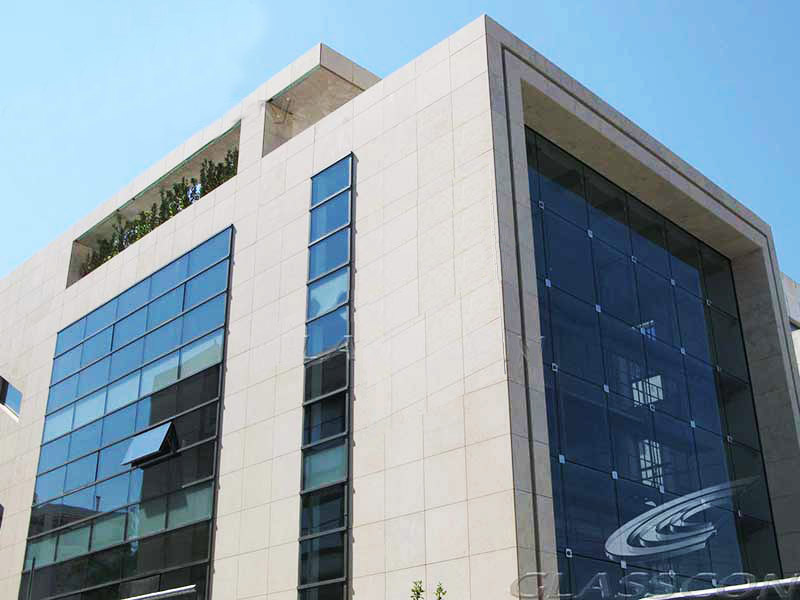 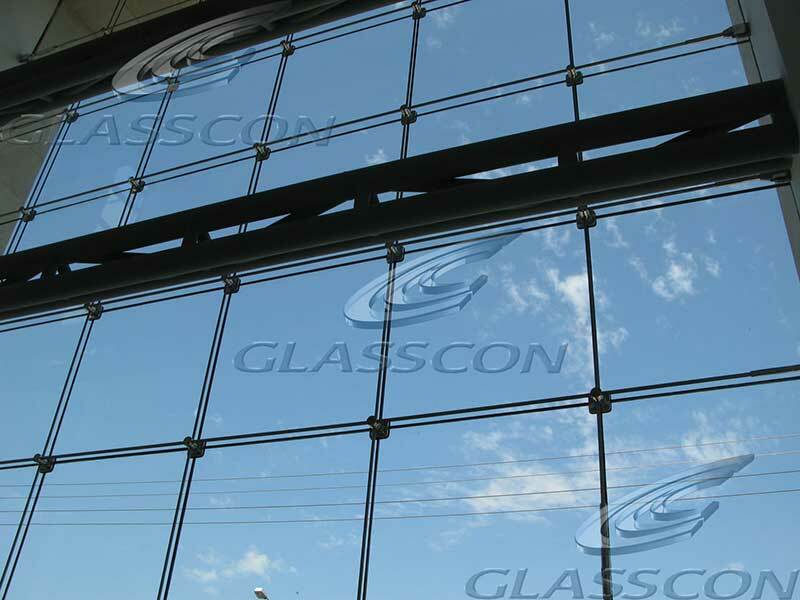 GLASSCONS PLANAR & SPIDER 2D INOX PRESTRESSED CABLES SYSTEM" can support any type of glass panels providing a light and modern architecture to the façade.Furthermore for architectural reasons GLASSCON has developed special custom-made stainless steel fittings with recessed LED spot lights. 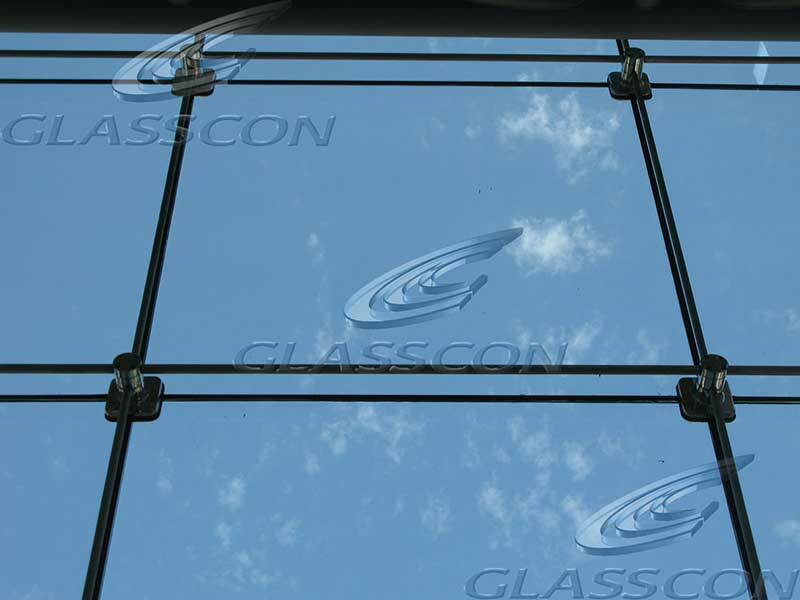 The point fixed - spider glazing curtain wall has a total height of ca. 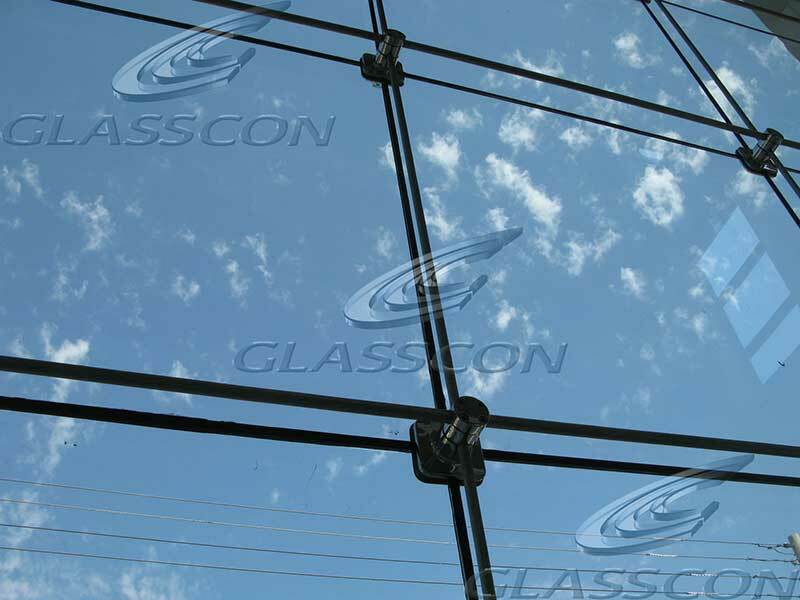 25 m and a width of 29.3 m & is supported through a grid of stainless steel prestressed cables. 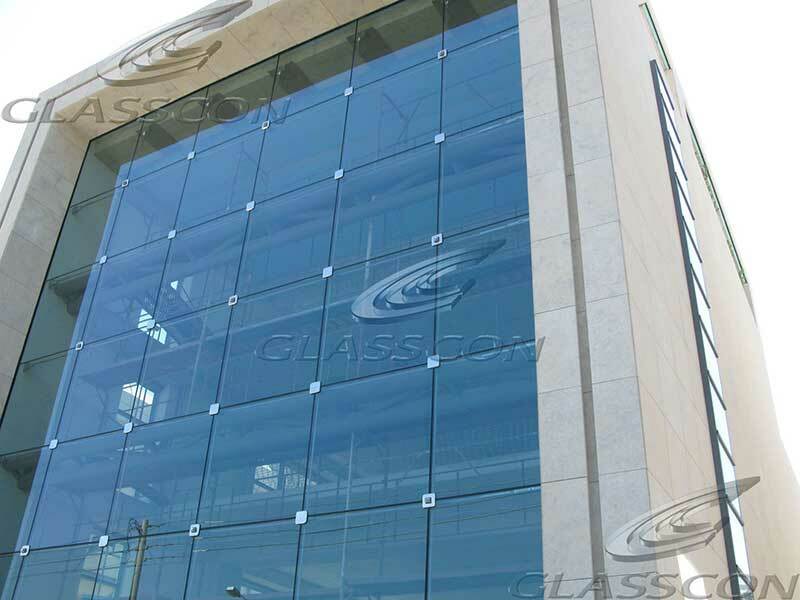 The loads (acc. 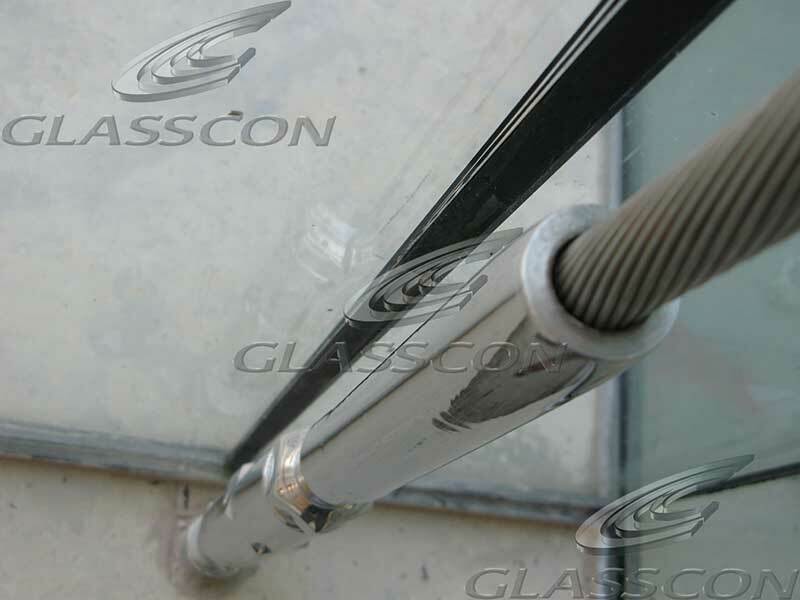 to EC 1) are carried through the Φ22mm cables. 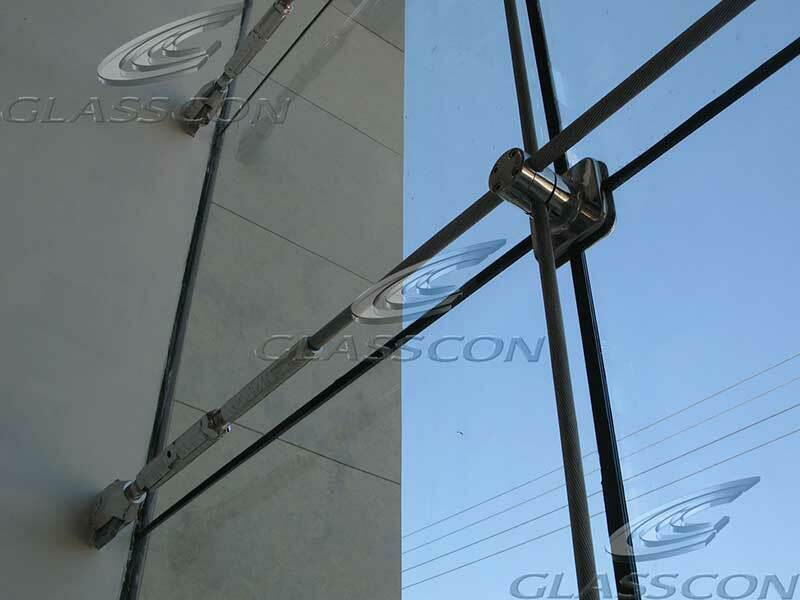 Reaction forces of 90kN have been applied at the horizontal cables and 43kN at the vertical. 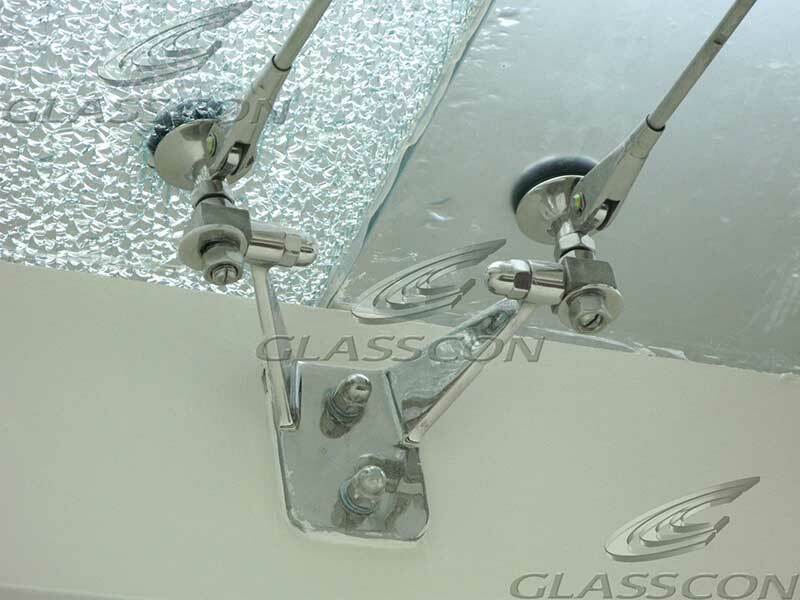 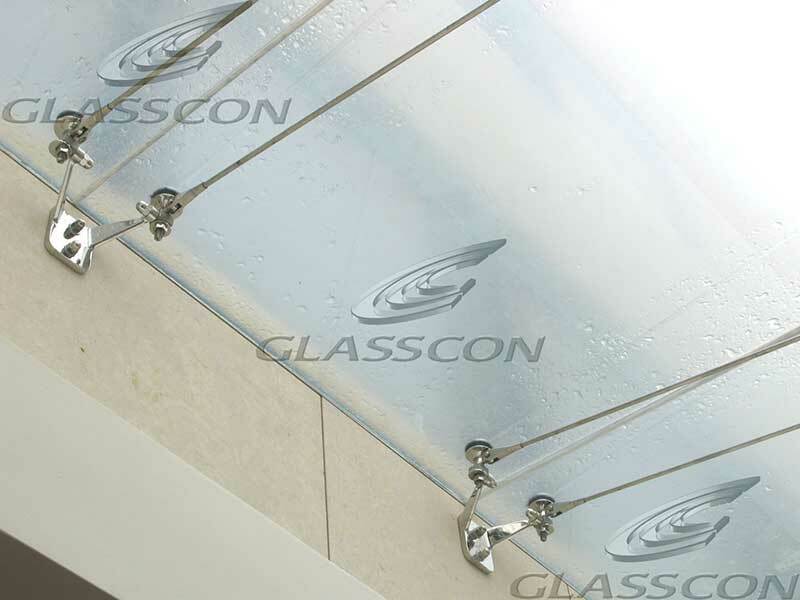 For architectural reasons GLASSCON implemented custom-made fittings with integrated LED spot lights.